Whether you are traveling east or west on Highway 87, you should take the scenic detour called the Utica Highway. If travelling east, turn south at Windham or, when driving west, drive through Hobson to get onto the highway. When you turn into Hobson you’ll probably notice the giant hay bale Medusa at the turn off. If the season is right, be prepared for more hay bale art. The farmers and ranchers in the area decided many years ago to start this quirky, public art display, and each fall, while driving along the road you will see several different hay bale artworks. be one of the best and biggest in the state. The Silver Dollar Saloon still stands, but is part of the frontier town display as you enter. Charlie Russell painted a scene of the town called “A Quiet Day in Utica,” depicting a man trying to ride an unruly horse, who sends the small town into chaos when the horse starts bucking. Russell lived with Jake Hoover in his cabin up in the Little Belt Mountains, and Utica is where he learned to be a cowboy. Utica’s museum sign welcomes you to Charlie Russell country. While inside (and outside) the museum, you will see many artifacts from the homesteader era. Taking it all in, you can see how little has changed in Utica these past 100 years. 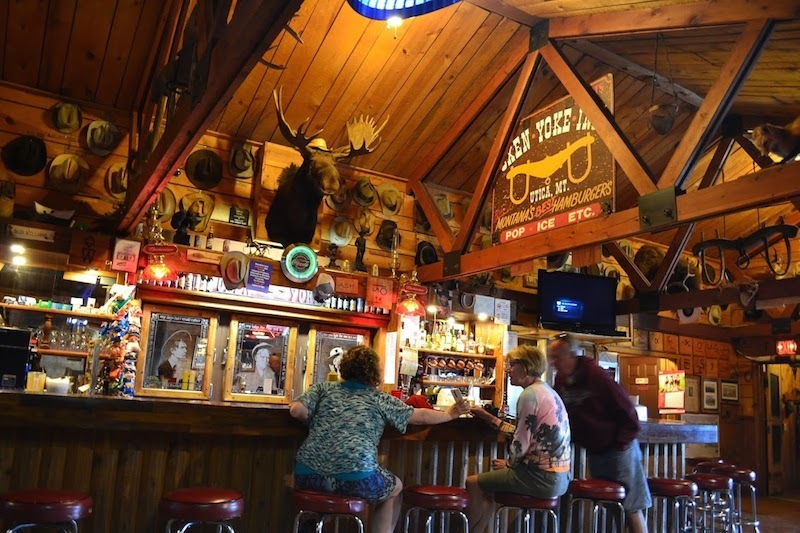 Leaving the loop at Utica, a short southern detour sends you down Pigeye Road, to your first stop in Sapphire Village: the Blue Nugget Bar. You shouldn’t be surprised that most everything about this small town revolves around these beautiful, little blue gemstones. A few hiking destinations lie within the Little Belts nearby. The Middle Fork of the Judith River Trailhead will send you on many river crossings en route to the many rocky arches along the trail. Heading south, the road narrows quickly and before long you are travelling between rocky canyon walls, crossing the South Fork Judith River many times as you continue. Many campgrounds and a few water gaps are worth stopping to view, plus the rocky outcroppings atop the Little Belt Mountains are beautiful, including Russell Point. If you continue, this rocky road will completely cross the mountains, exiting near Martinsdale. A much shorter detour, south of Hobson, is the recreational centerpiece for the area: Ackley Lake State Park. A great beach encircles most of the lake, as does a gravel road, so you can visit every nook and cranny of this lake. A water wonderland during the hot days of summer, there’s a dock for boats and jetskis, as well as plenty of space for good fishing and good photography angles. Views west of the lake include the Little Belts, and views east include the Big Snowy Mountains. Ackley Lake was in jeopardy of losing its State Park designation; fortunately the lease was extended until 2021, so go visit! The largest town on this loop is Hobson, totaling a whopping 216 people. A wide avenue, spliced with a grassy median, runs alongside the beautiful, colorful downtown, stretching from the grain elevators below to the school at the top of the rise. It’s a nice little town, with good people, guarded by a tentacled medusa made from hay bales. Only in Montana!